Big fish angler Tim Webb visited the Maeklong River for a two day trip accompanied by scientists from the Chulalongkorn University and a Victor a travel journalist. Fishing on the first day saw baits positioned at various points across the tidal river in readiness for some action from the resident wild stingray population. The day proved to be very difficult angling and unusually no takes or bites were received and the rods remained motionless for the entire day. The second day saw the team moving to various parts of the river in an attempt to locate the freshwater stingrays. After moving for the third time one of the floats burst into life and began bobbing up and down signalling the presence of a stingray. After winding down into the unseen fish the rod tip pulled down towards the surface of the water as it took up the weight of the stingray deep below. The fish responded by stripping a few yards of line and moving off on a slow run across the riverbed. As Tim piled the pressure onto the unseen stingray it became clear that the fish was not a big one and the stingray was quickly brought off of the bottom into mid water. With the hard work done Tim slowly brought the fish to the surface where it is barb was made safe with a bandage. 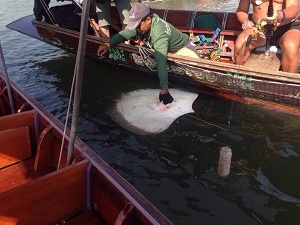 The stingray was then brought into the boat where Dr Chansue and her team of scientists from Chulalongkorn University conducted various scientific procedures and recorded all measurements of the fish. 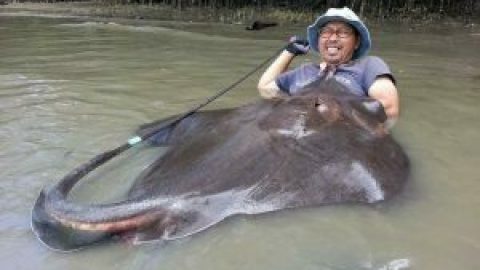 The freshwater stingray was estimated to weigh 25-30kgs and was identified as a small female before being slipped back into the river and swimming away strongly. No further action came to the anglers rods for the rest of the day and before long the river had dropped to its lowest levels ending the days angling. The Maeklong River on this occasion had fished very slowly and with the two days fishing having only produced one small stingray the fishing could be described as hard work. Accompanying journalist Victor photographed all of the proceedings throughout the day before visiting the nearby Amphawa Market to continue his travel article. Thanks to Tim Webb for supplying the only stingray of the trip, the Chulalongkorn University research team and Victor the photo journalist for accompanying us.